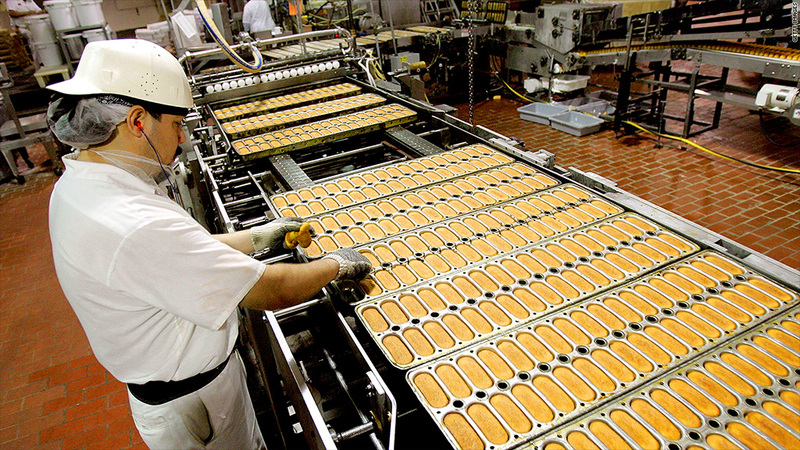 Twinkies are now produced by a joint venture between Apollo Global and C. Dean Metropolous. Twinkies are back in stores. But most of the jobs of the people that make them won't be returning any time soon. There were 18,500 people working for Hostess Brands when the company went bankrupt in November, making Twinkies, Wonder Bread and a variety of other brands. But only about 20% to 25% of those jobs will end up returning when all the brands are up and running again, according to estimates by Natalie Everett, a bread and snack industry analyst with IBISWorld. Typically, companies that buy iconic brands like those produced by Hostess invest in equipment and machinery to replace laborers -- which is why the jobs aren't coming back, Everett said. Hostess had two main unions when it went under: About 6,600 employees were members of a bakers' union and worked at 33 bakeries nationwide, and 7,500 were drivers who belonged to the Teamsters union. Hostess announced plans to liquidate in November after offering workers a new contract with reduced wages and benefits. The Teamsters accepted the deal, but the bakers' union rejected it. 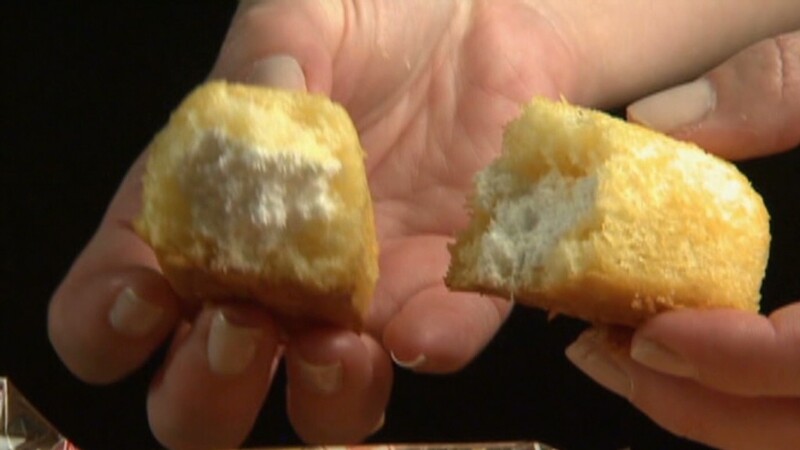 Hostess management blamed the bakers for forcing the company to shut down. Twinkies and a number of other Hostess snack brands were purchased by a joint venture of Apollo Global Management and Metropoulos & Co. The new company bought five bakeries but will only operate four. Hannah Arnold, a spokeswoman for the Apollo-Metropoulos venture, said the company plans to use 1,800 workers to produce a full line of Hostess snacks, including Twinkies. The old Hostess had roughly 2,500 workers producing snacks. Arnold cautioned that it's "nearly impossible" to compare the two, because the new company did not buy rights to all of the brands that the old Hostess produced. Some of the reduction in jobs is also due to the new owners' different business model. Instead of using truck drivers as salesmen to deliver the product and stock the shelves of about 50,000 stores, the new company will hire outside trucking firms to deliver trailers full of the product to retail distribution centers. The company says it will be able to reach even more stores that way -- an estimated 110,000 nationwide by the end of the year. Some jobs won't be coming back due to the permanent shutting of nearly 600 outlet stores the old Hostess Brands operated to sell products directly to consumers. Flowers Foods agreed to buy Wonder Bread and most of Hostess' other bread brands -- as well as 20 bakeries and about three dozen depots -- for $360 million. A Flowers spokesman declined to comment on staffing at these facilities because the deal hasn't yet been finalized. A former Hostess sales representative in New York told CNNMoney that he was in the process of applying for a job with Flowers, as were a number of other ex-colleagues. "It's a shame what happened -- we've got families to feed and we lost our benefits," the man said, requesting anonymity to avoid harming his job prospects. One challenge for Hostess is that the entire sector has been seeing weak sales for several years. "The general health trend is people avoiding bread products, avoiding carbs, avoiding glutens now," said Everett, the industry analyst. "The sweet treats that Hostess sold, they also have a bad rep. That said, they wouldn't be coming back if people didn't love them."